One thing is certain catching a bone fish could be one of the most difficult catches any angler can achieve. Regarded as one of the two finest examples of fly game fish, this is one fish that knows how to remain hidden, and although a sighting can come at anytime, our friend Albula Vuples is not going to make it easy for you. The colouring of the fish make it almost impossible to see one swimming in the waters, due to the dark scales on its top and the silvery-white flanks acting as an underwater mirror. This is brilliant for the fish, but hard for us anglers as the mirroring effect will pick up the reeds and plants that they swim past down at the bottom and make them disappear. So it's no surprise that this ability to simply vanish has led it to kave the name of the Gray Ghost. The fish will most often be found throughout the flats around the Florida Keys, where it feeds on the incoming tide. And with the Florida Keys flats being the home of some of the most knowledge charters for hire around, you can give yourself a great chance of catching a bonefish, by utilising the experience of the men that have lived on and around the waters for generations. Check out our expanding information on the best and most experience charters and marinas to make your Florida keys fishing experience a lifetime memory. But let's tell you a few things that you need to know about the fish starting with where the best place to find one is. It’s not often that we tell you that the best places to catch a fish can be achieved by getting in your car and driving, but that is definitely the case with the bonefish. Take a look at the map of the Florida Keys and you will see two state parks listed. The first being the world famous John Pennekamp Coral Reef State Park, known the world over as being the world’s first underwater state park, and the keeper of the only living coral reef in the whole of the continent of America. And serving our purposes another claim to fame would be the superb expanse of flats water that has been an ideal habitat for the Gray Ghost forever and a day. Although of course when you get to John Pennekamp you will need a boat, you will find a selection of canoes and motor boats available for hire. In fact most things that are able to stay afloat in shallow water will do the trick, although I think I would be happier with something more substantial where I can safely store my rods, tackle and bait. So know you know that Pennekamp is the place, let’s narrow things down even more, and put you right on top of the fish. Make sure that you have a good steer of your compass directions, as it will make quite a bit of difference which way the wind is blowing. If the wind is blowing from the East then make your way over to Largo Sound, and on the north-eastern side, the waters will be quite protected and therefore perfect for our requirements. The other is the flats over on the Atlantic up in Key Largo, where Garden Cove makes its way down to Lower Sound Point. This is probably the most fished area, as it doesn’t make a great deal of difference to which direction the wind is blowing to still be able to go after the bone fish. So that covers Pennekamp State Park, so now lets take a look at the second place that is perfect for our requirements is State Park down at Long Key. And this area can be fished even if you don’t have a boat or don’t fancy the extra expanse of hiring one. Simply take your shoes and socks off, or wear a pair of waders, and walk out into the water. Some amazing bone fish catches have been made this way. A real back to basics type of fishing, and although I previously said I prefer a nice boat it does make a change every now and again, to stand up to your waist in the salt water of the Keys and look for a splash of the bonefish’s tail as it pops out of the water. 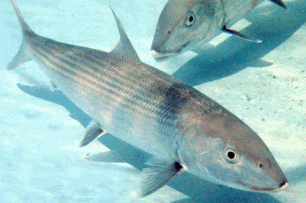 How To Spot A Bonefish? There are three ways that one will be seen and they are mudding, tailing or cruising. A mudding bone fish is quite easy to spot, as the clues to their whereabouts are there for all to see. You see as the fish feeds on its favourite diet of crabs and shrimps down on the bottom of the flats, they do something called “Making Mud”. As their snouts dip down into the sand and silt eagerly searching for dinner, the sediment gets all stirred up and floats up to the surface in a cloud, and carried away on the tide. You can see these muddy clouds quite easily, which point to where you should cast your rods. 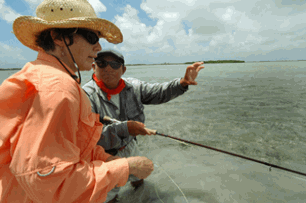 So that is mudding and is useful for the first time anglers eager to catch a bonefish. The second one is tailing, and isn’t as easy as the mudding, but still is a great clue to whereabouts; you just need to be paying attention. Because the waters can get particularly shallow around the flats, the fish will go down to the bottoms to grab their food and their tails will stick above the waters as they do it. It’s been likened to a silver flag waving around, and that’s as good a description as you are going to get. The last way is the most difficult of all them and you really need to have some experience of the waters and the movement of the bonefish to use the method “cruising”. As the fish swim under the surface it will disturb the water slightly, and I mean slightly. It really takes an experts eye to spot “Nervous Water” as its known, but once you get the hang of it you really have all the armoury that you need to gain the upper hand as your pursue old Albula Vuples. There are two periods of the year when without a doubt the conditions are optimised for fishing for Bonefish and they are either September to November, and March until June. The reason for this is the feeding habit of the bonefish means that they spend all their day feeding, which now that you know the three ways of spotting one, makes it a great time for fishing the Florida Keys Flats. The Best Bait To Use? Shrimp, Shrimp and More shrimp.